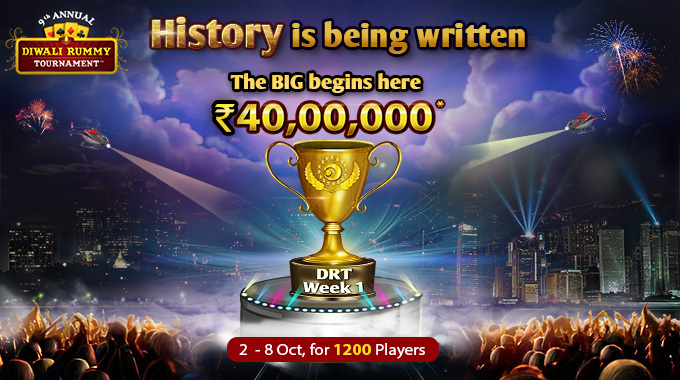 RummyCircle has announced another season of Diwali special rummy tournament with bigger than the big cash prizes. The 9th season will bring more than one thousand players to compete with each other and win cash prizes worth Rs.40 Lakhs each week. The tournament for the 1st week is already live and can be joined by winning your ticket by participating Shooter or Satellites. If you play rummy to win cash, this Diwali Rummy Tournament is a blessing in this festive season. You can join on the multiple satellites or shooter rounds at your will and win your ticket for the grand finale. Just log in with your RummyCircle credentials and get seated for this exclusive festive tournament. How to Join Diwali Rummy Tournament? If you play rummy for cash at RummyCircle, you have three options to make your way to the grand finale of Diwali Rummy Tournament. You can join the Shooter, Satellite or Super Satellites from 2nd October to 6th October to win your ticket for the finale worth Rs.40 Lakhs. The 5 Shooter rounds can be joined with an entry fee of Rs.40 and will reward you with a 3 PM Satellite ticket. If you want to go directly to the Satellite, you can do so by booking your seat with an entry fee of Rs.400. The 5 Satellite rounds will reward the top 88 players with free tickets to the finale of DRT. Other than these, you can also join the Super Satellites for less competition and an easy route to the grand finale. Book your seat on the Super Satellites for Rs.4000 and play cash rummy with up to 25 opponents for your entry ticket to the DRT finale. There will be 2 Super Satellites scheduled at 6:00 PM and 9:00 PM. The grand finale of Diwali Rummy Tournament will be held on 8th October 6:00 PM. All the players who have earned their tickets from satellite rounds are eligible to play in the finale. The top 1200 winners will share the prize pool worth Rs.40 lakhs. If you love rummy for cash games, get into the festive mood and play on the Diwali Rummy Tournament for maximum fortunes! Also, subscribe to RummyMania to get the latest news on Indian rummy, tournaments and promotions.